Kurt Wegleitner, Managing Director for Addcon, talks about Performance 2017. 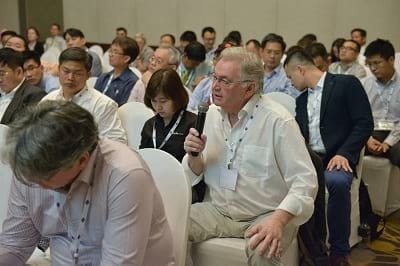 “Managing hyperprolific sows in Asia” was the motto of the Performance 2017 which took place on March 14th before VIV Asia 2017. Dr. Piet van der Aar, Managing Director of Schothorst Feed Research opened the 1 day seminar with his presentation on “A review of the Asian situation: clarification of the specific situation helps identify real needs” and guided through the day. The second presentation was given by Dr. Wayne Johnson from Enable AG-Tech Consulting in China on “Back to the roots: how a pig farmer’s life is impacted” One of the key messages of Dr. Johnson was that farmers need to spend more time in the farm rather than in the office. Only this way, farmers can see actual and possible problems and eliminate the same. “Modern genetics: time to think out of the box in Asia” was presented by Greg Simpson a swine nutritionist from Canada who is product manager with the dutch genetic company Hypor. In his talk he has shown that the same genetic is giving different results in Europe, the Americas and in Asia, which is only partly explained by the different climates in the region and the related heat stress. He has also given his view on the “tool box” which is available for the industry. By choosing the right tools, the industry in Asia has all possibilities to close the performance gap. Pierre Lebreton, technical director of France based Tecnor-Sofac spoke about “Key moments in Asian sow-cycles: how can we leverage them by using functional ingredients? The contribution of special fibres on gestation, farrowing and birth performance”. He started by saying that we must invest in sows and earns with piglets before he give an insight on his experience with modulating swine diets in Europe and he highlighted the importance of choosing the right source of fibre for those diets. The importance of “Supporting healthy gut management strategies in Asian conditions using diformates” was presented by Addcon´s technical director Dr. Christian Lückstädt from Germany. In his presentation, he showed that it is important that feed additives must reach the gut in order to work most effectively. He presented a number of studies which were conducted in the challenging conditions of Asia. Dr. Jens Noesgaard Jørgensen from Chr. Hansen A/S in Denmark give in his presentation on “Lactating sow feeding: optimising sow and litter performance and health” an excellent overview on the latest data on the swine industry in Denmark. In his presentation he has shown that swine farms in Denmark wean on average 31.4 piglets per sow per year already and it is expected that this number is going to rise. He had also stated that the farm average in Asia is still lower than in Europe due to various reasons. “Dietary fibre, heat stress - updating feeding strategies for sow feeding in hot climate” was the topic of Gilles Langeoire an independent industry consultant from France. He has focused in his presentation on new feed strategies for hot climates, on evaluating the feed quality on its net energy and he had highlighted also how important sufficient supply of high quality water is to pigs. Professor Dr. Rommel Sulabo from the University of the Philippines Los Baños spoke about: “From newborn piglets to growing pigs: how quality feeding can help during the critical phase of weaning” and emphasized on how we can increase performance in Asia. The potential is definitely there, but the level is not what we expect. In piglets, we need to focus on transition as weaning and first 7 days. Feeding practices, feed intake, maximum performance for Low birth Weight piglets are keys points. Train people to increase their skills. Start with audit then move...and do not forget teamwork! We have to set better Key performance indicator in our “Live manufacturing processes”. Collect data is essential. And the power of a professional database can help us. And we should look for better way to predict outcome when we go for investments. A great tool box of feed-additives is available but we need make better use of it. And major practical point: stop restricting feeding in lactation! And finally Dr. Piet van der Aar summarized his opinion in the following key points. The size of farms steadily is increasing, this giving new opportunities for the nutritionists. But more work means also better management. It is a lot about fine-tuning this scaling-up. Keeping the animals is a real job, it is not only about just feeding them. Gilts and G2 have different requirements than older sows, smaller piglets should be separated from other ones; this actions can be done tomorrow by the nutritionist. Motivation of the workers is a key issue: we all need to adapt our skills in change management. 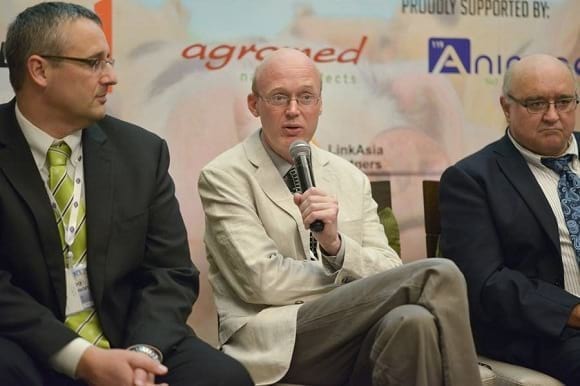 Above many things the panel agreed that we can also reach the genetic potential of sows in Asia. For reaching it we must continue to invest in highest quality feed, we need well trained and highly motivated staff and we must spend more time in the farm. The event was proudly sponsored by Addcon, Agromed, Animine, Chr. Hansen, Hypor, LinkAsia Partners and was covered by International Pig Topics. The sponsors have agreed to organise the Performance conference again in March 2019 in Bangkok. Invitations for the conference including the program and the venue will be sent to the industry in time.